Circumstance is invariably affected by or affects our work and our mindset. What does it mean in my life when peanut butter has become something of value? What we have here is roughly one half of the most poorly constructed peanut butter and jelly sandwich one might ever see. Not only is it on flimsy, wholesome wheat instead of tasty white bread, but there isn’t even enough peanut butter to cover the whole slice, no matter how much coercion one might apply. Any growing young boy would cringe at the sight and outright refuse such a lackluster spread. Lets examine the setting a little further. My disgraceful sandwich-in-progress sits pretty atop a styrofoam plate, which I did not buy, but inherited from a friend who left town. The table is made of boxes, from purchases, some of which I did not make. The contents of the sandwich, are also legacy items. Half a jar of peanut butter and some wheat bread (which, normally I wouldn’t be caught dead with) that had probably traveled between three and four hundred miles through 3 states in a run-down RV. The jelly, at least, is my own, bought specifically as a pairing for the peanut butter I had come upon so luckily. There are times in life where it pays not to take yourself too seriously, and realize the frivolous nature of certain standards. I am not a growing boy (though I may at times wish to deny it), and this sight did not elicit that type of reaction; although it did set off a bit of introspection in me. It raised questions of “what do we do,” or possibly “what does it mean,” in our lives when something, previously so commonplace, becomes a commodity? 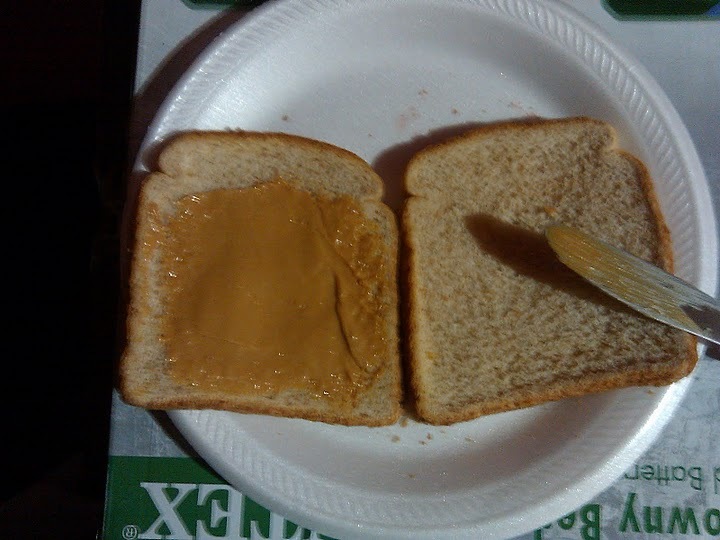 I ate a peanut butter and jelly sandwich for lunch every day from K through 12 almost unfailingly, almost to the point where I couldn’t taste it anymore, and here I am my first few months truly out “in the real world” and within 6 weeks, I fail even to meet my previous standards for what is mundane. On one hand, it could be seriously disconcerting to note that I have reached the point of affecting the baser elements of my life, far beyond just removing the more luxurious elements of fine dining and plush linens. On the other hand, it really only affects a few simple things. If I am still eating, sleeping, and keeping decent hygiene, how much do the specifics really matter on aspects of my life that tended to be uninteresting anyways? There are times in life where you will eat for pleasure, and there are times in life where you will eat for sustenance. This meal is mostly definitely one for sustenance. I don’t know if you paid attention to the box-table, but the sandwich is on top of the box for a $20 air mattress that I also got recently from some transient friends heading back east, fortunately for me, without a majority of the items they had come here with. 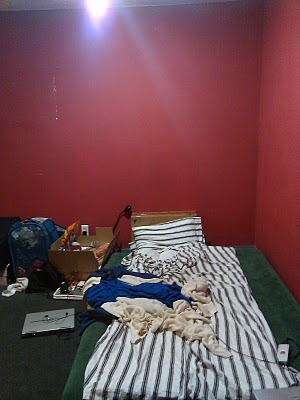 Before that I was sleeping on about two inches of foam, blankets, and comforter – just about anything I had which was soft soft that I didn’t need to keep me warm at night. Needless to say, my first night on this beauty left me pretty well rested and ready to take the world on head-first. But that’s just it you see, my focus has shifted so completely from these minor details that I mostly couldn’t care less. And the results have been a bit staggering. In my first week, on somebody else’s bed, a couch, and the aforementioned floormattress, I programmed the most “fun” game I’ve ever made. Two weeks later I created the website that you see right now. About a month and I’m working on two of the most challenging code projects I’ve come across to date, and working on websites number 2 and number 3. Essentially, in these few weeks which have been far from luxurious, I’ve generated more concrete value than most, if not all particular time spans prior to it. There are times in our life where we will work for sustenance, and there are times in life where we will work for pleasure. Now I don’t mean to lead anyone to the wrong conclusion. I am not under the impression that one situation should dominate the other in life. I mentioned them both because I think they are both necessary and valuable. It may be notable, however, that we often work for pleasure, so that we can eat for pleasure, rather that working for sustenance, so that we can eat for pleasure. Though the eating for pleasure and working for sustenance coincide, it is really the working for pleasure which brings us to such a point where we may eat for pleasure. Meta side-note: just take a look at the tags list for this post, I’m sure you can even imagine how strange, right? I can’t take credit for the layout, it was taken from madebyon.com with some tweaks ofcourse, but thank you very much for the compliments. I’ve really only been blogging for a few months, and fairly irregularly. For me its just a unified place for my work and my ideas especially those I may want to reference to others, and more importantly it was a chance to learn how to work with WordPress and web design and development. The depth of introspection here has caused the vision of this singular PB & (not quite yet) J sandwich to impale itself on my heart and mind. Although the PB&J has always held a dear place in my heart for reasons too numerous to mention here, this one photograph signifies a right of passage that I am so proud to witness. I am in total admiration of you the creator, and your ability to see beyond. Just as the sweet and salty combine to produce the ultimate comfort food, your words have effortlessly emulated the quiet and pragmatic dignity of the PB&J, and provided a form of comfort to my soul. Without being at all condescending in your words, your profundity make things such as “champagne and caviar” seem sophomoric. I can tell you are one who appreciates the finer things in life without being owned by them. You are a rare breed who is discerning in all the ways the rest of us are not. Seeing value in all things great and small. Much like the late Dr. Seuss’s beloved Horton. I must leave you now, as the simple whisper of a toasted PB&J is calling to me. Just as your words have inspired a stirring in my heart, I now feel a rumble moving into my tummy. 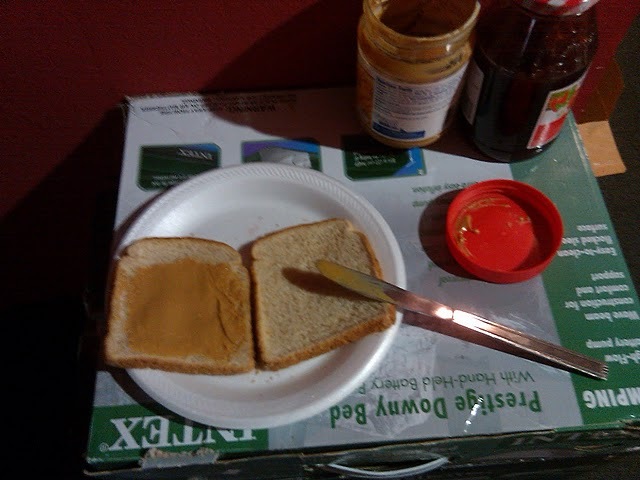 I shall pair said PB&J with a tall cold glass of Ovaltine. Shaken NOT stirred. Forgive me that tiny bit of pretentiousness. Please keep on blogging. I would love to know how you “see” a bowl of Ramen, a box of mac and cheese, or a packet of Kool-Aid. Enlighten me :).